Cyclists share the road with cars and streetcars heading east on Queen St. West near Bay St., Oct. 10, 2018. 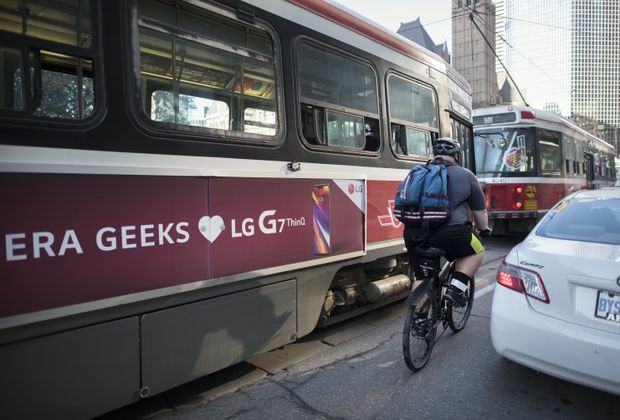 A spate of dangerous incidents involving streetcars has highlighted the risks these vehicles can pose on Toronto roads. Although the three serious collisions so far this month – two fatal – have little in common beyond the presence of a streetcar, they reflect Toronto Transit Commission statistics showing that these vehicles can be more dangerous to people than buses. According to police, a person was walking last week on the dedicated transit lane on the Queensway, near High Park, when struck fatally by a streetcar heading the other way. Monday’s victim was a cyclist who fell to the road near Queen Street East and Broadview Avenue and was hit fatally by a streetcar. In a third incident, a person was injured early Wednesday by a streetcar on Roncesvalles Avenue. Traffic Service Sergeant Brett Moore noted that unexplained clusters of collisions can happen, pointing out that there had also been two people hit recently while riding mobility scooters. He said it would be premature to identify the streetcar-related incidents as a trend. Three people have been killed this year in deaths related to TTC vehicles, including the two this month hit by streetcars. The only fatality involving a bus was an unusual incident in May in which an 82-year-old woman riding on one fell when the vehicle’s operator braked sharply after being cut off. The woman died about a week later. According to a Globe and Mail tally, 32 pedestrians and five cyclists have been killed so far this year in Toronto. Although the TTC-related deaths are only a small part of that total, they do reflect longer-term statistics gathered by the agency. While TTC buses are involved in many more collisions than streetcars, about four times as many in the decade from 2008 through 2017, the two types of vehicles were involved in roughly the same number of pedestrian fatalities over that time. According to the agency, there are several factors that could make streetcars more dangerous. Streetcars are very heavy and take time to brake. They are also, by their nature, fixed to a track and cannot swerve to avoid someone. And they tend to operate in the busiest parts of the downtown, where pedestrian and cyclist volumes are the highest. Transit-only lanes are a particular danger, according to the TTC. These dedicated rights of way, which are featured on a number of busy streets, including Spadina Avenue and Queens Quay, are often used as a refuge by pedestrians crossing mid-block. To prevent these collisions, the agency would like to erect barriers in places.